Product keys (also known as serial numbers) is a 25-character code used to protect the products against piracy. 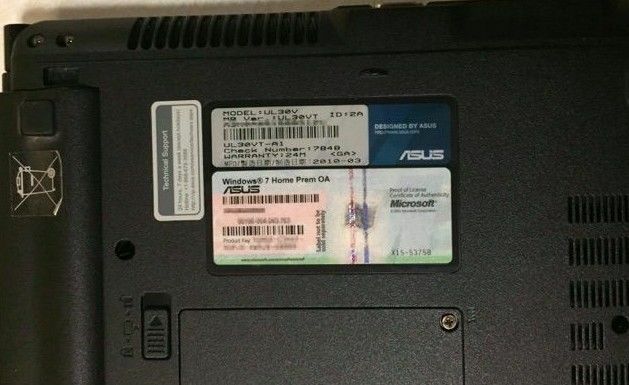 When you reinstall Windows on the same PC or move your copy of Windows from an older PC to a new one, you'll be asked to enter a serial number to prove that you've paid for it, but what if you do not know what the product key is or where to find the product key as the time goes by. 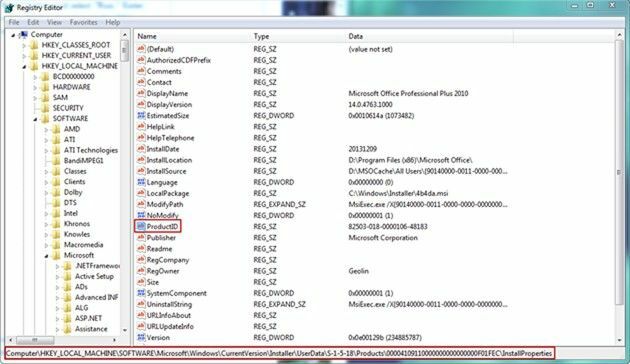 Then this post is what you right need, in this post, we will guide you to locate the product ID on Windows 7 with 4 ways, just check it out soon! Normally this product key is on a bright sticker located on the back of your computer or inside the Windows 7 installation disc case. So, the first thing you need to do is look inside the Microsoft Windows disc jewel case you received at the time you purchased your product or find the 25-character product key from the back of the computer. You can also check the confirmation email you received from Microsoft at the time you purchased or downloaded Windows 7 to get the Windows 7 product key, as the confirmation email contains your Windows 7 product key. If you don't have a physical copy of your product key, that doesn't mean it's gone forever. Luckily, you have a copy of your Windows 7 key stored in registry. 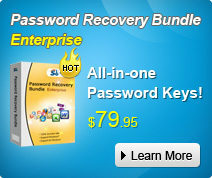 Hence, below we will guide you how to find Windows 7 product key in registry. Step 1: Click Start button and select Run to open Run box. Or press Windows + R keys to open Run box. 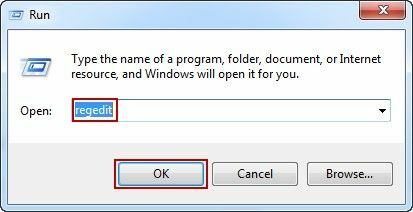 Step 2: Type “regedit” in the Run box and click OK button to open Windows Registry Editor. “HKEY_LOCAL_MACHINE\SOFTWARE\Microsoft\Windows\CurrentVersion\Installer\UserData”all the way in the Registry Editor and press Ctrl + F keys to locate “ProductID” key. But unfortunately, this product key is encrypted, meaning it's not easily readable. So you need to take advantage of a program such as the Magical Smartkey Product Key recovery to help you read the serial number. 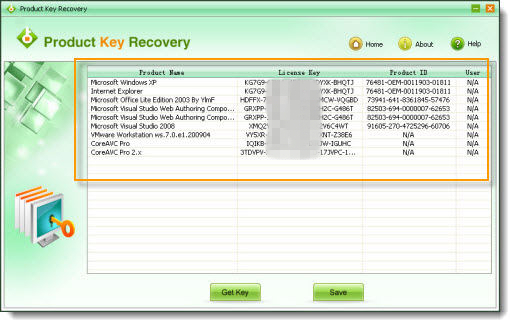 Smartkey Product Key Recovery is an easy to use key finder to quickly check out the Windows 10/8.1/8/7/XP/Vista product key and display it for you. Just follow the instructions below to get started. 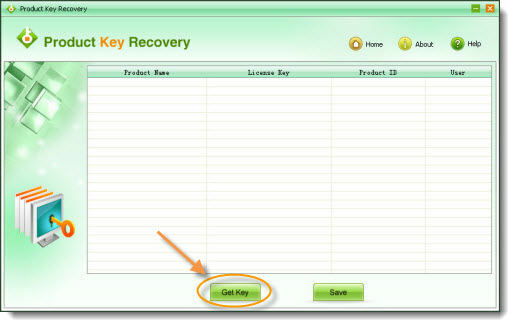 Download Product Key Recovery and follow the installation process to install it on your computer. Launch the program. Click "Get key" on the bottom and start to retrieve lost Windows 7serial number. The program scans your hard drive automatically and displays your product key in the task list after seconds. Hope this article is helpful to locate and display the product key with these 4 methods we provided. If you are a Windows 10 users, you can find the product key using command prompt or powershell. For detailed tutorial, just read How to Get Free Windows 10 Product Key 2017. If you have any questions, feel free to comment. Enjoy! How to Find Windows XP Product Key?